Solar pool heaters help to reduce your pool's carbon footprint. You'll get the satisfaction of knowing that you're heating your pool with the most cost-effective, cleanest, most environmentally friendly source of energy there is...the sun! Solar Industries has been extending swimming seasons for more than 40 years and our solar pool heaters are so reliable, the only maintenance you'll need for solar pool heating is to do your usual pool maintenance or winterization. A solar pool heater is clean, easy, cost effective, and gives your family and friends more swimming fun every year. 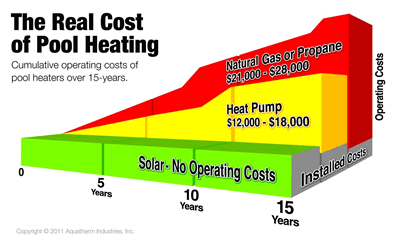 Save on Solar Pool Heating!